The historic city of York is jam-packed with visitor attractions, including the impressive Minster, the city walls, and the Shambles. There are also several antique centres in the city centre, conveniently close to the other shops. While the narrow cobbled streets can be extremely busy with tourists in summer, out of season it can be an enjoyable place to wander around. We visited York recently and while we were there, paid a visit to two of the antiques centres - The Red House Antique Centre and The Antiques Centre York - and the National Railway Museum, which proved surprisingly interesting from an antiques perspective. The Red House Antique Centre is spread out over two floors in a red building just down from the Minster. It is open 7 days a week and houses a huge range of items including silver, ceramics, jewellery plus a selection of Art Deco furniture and ceramics alongside a map room on the 1st floor. There's also a room dedicated to antiquities (e.g. items from Ancient Rome/Greece) and if you venture back downstairs, you will find a room full of Grandfather clocks! It really is an interesting place to wander around. The Antiques Centre York on Stonegate is another good-sized centre and is spread out over 3 floors. The centre claims to have over 100 dealers and there certainly is a wide range of goods on display, mostly from the 19th and 20th century. Stonegate also has a 1st floor caf� and the centre's staircases are lined with pictures and prints, ensuring every last bit of space is utilised. In both antique centres, you�ll find that most items are in locked glass cabinets. To view an item, you simply have to take a note of the cabinet reference and ask a member of staff to open it up for you. They will be happy to let you inspect the item without any commitment to buy it. When we visited, both centres they had a nice selection of items on sale and were fairly busy. After our tour of the antique centres, we headed out towards the National Railway Museum, which is just behind the railway station. This museum is a fascinating place that is open daily and, amazingly, has free admission at all times. 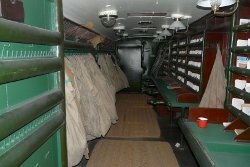 The museum has two main halls, which contain the trains, plus a Warehouse, which contains a fascinating mixture of railway items in storage. 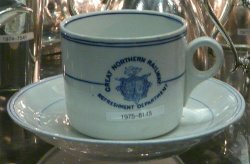 These range from china dinner sets to railway signs to items of furniture - all of which have been rescued from the railways at the end of their working lives. 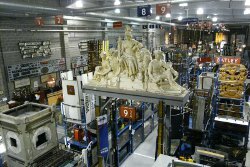 Walking through the Warehouse is truly fascinating; you are surrounded by antiques and collectables (all in clear storage crates) that were once everyday items. The trains are no less impressive, and there are lots of them. When we visited, highlights included the streamlined Duchess of Hamilton, a stunning example of Art Deco design, and a Japanese Bullet Train, which you can get on board. 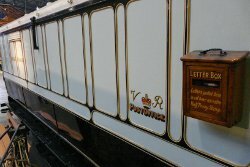 Also of interest from an antique point of view were several historic royal trains and an early travelling post office, both of which provide a fascinating glimpse into the past. We've added lots of new pieces to the Perfect Pieces website this month including some very collectable and early PenDelfin rabbits and some lovely pieces of Troika Pottery. And remember, if you've visited any good Antique Centres or sites of interest to fellow collectors then do let us know!